Today Samsung’s latest flagship Galaxy S4 got another minor update. This update is of 28.55 MB, that brought “improved Stability”. The update is available through OTA (over the air) and Samsung KIES. This update will be applicable if the kernel version is 3.4.5-768420. 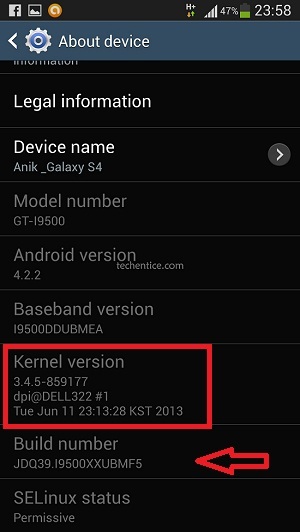 It will upgrade the kernel to 3.4.5-859177. Though it is not specified clearly that what kind of stability improvement it brought, we experienced that the TouchWiz and App switching is looking smoother than before. We have not seen any other significance changes. If in your Galaxy S4 the “Auto Update” option is already enabled, you will get a “New Upgrade Available” notification. 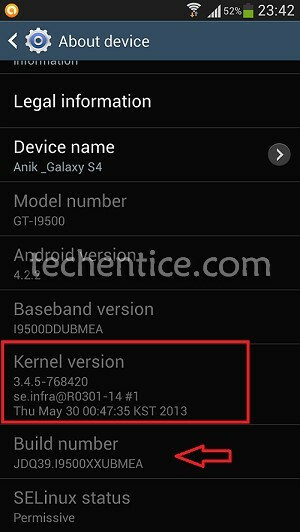 In some regions Samsung also sent SMS to Galaxy S4 users to upgrade their devices. You may also update your Galaxy S4. Go to Setting > More tab > About Phone > Software update and tap on Update option. You can see Previous Kernel Version and Build Number. Download the Update and let it be installed. Device will reboot during the installation of the update. After successful installation, check Kernal Version and Build Number. If you have seen any significant change after installing the latest update, let us know it. How to delete pagefile.sys in Windows 7? 1. There is now an ever-present tab on the left hand side of the screen that allows you to open two program windows at the same time. I can’t see how I’m going to be using this, and the tab has gotten in my way a few times already. 2. In messaging, you are no longer able to swipe to the right and automatically call your contact. Now, you have to click on the contact icon and then click the call button. I am not happy about either of these updates. Hi katy, the tab is there on the left side of your screen, because your Multi window feature is turned on. You can turn it off any time from your Notification Pane or by going to the Settings. Wow. I feel a little silly for not noticing that. Thank you!